Two billion people today identify as Christians, with the implication that Jesus is the focus of their relationship with God, and their way of living in the world. Such followers of Jesus are now more numerous and make up a greater proportion of the world's population than ever before. Despite its decline in the West, Christianity is rapidly increasing in areas such as Africa and China. 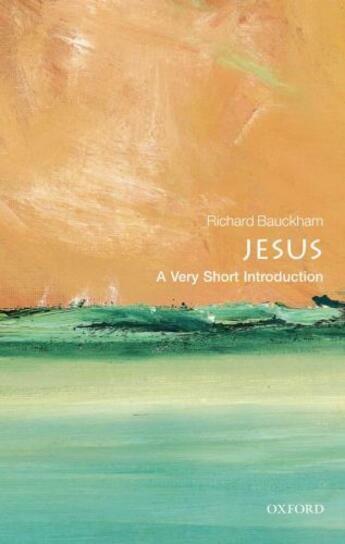 Richard Bauckham explores the historical figure of Jesus, evaluating the sources and concluding that they provide us with good historical evidence for his life and teaching. In order to place Jesus in his proper historical context, as a Jew from Galilee in the early first century of our era, Bauckham looks at Jewish religion and society in the land of Israel under Roman rule. He explores Jesus' symbolic practices as well as his teachings, looks at his public career and emphasises how his actions, such as healing and his association with notorious sinners, were just as important as his words. Bauckham shows that Jesus was devoted to the God of Israel, with a special focus on God's fatherly love and compassion, and like every Jewish teacher he expounded the Torah, but did so in his own distinctive way. With a discussion about the way Jesus understood himself and what finally led to his death as a criminal on a Roman cross, he concludes by considering the significance Jesus has come to have for Christian faith worldwide.